Obviously above we have the Brandenburger Tor, which is actually the closest I ever got to West Berlin (other than riding the bus through it en route to/from Tegel Airport). When you spend a lot of time in Paris, I think you fall victim to something I’ll call the Triomphe Effect; the afflicted lose all sense of scale when it comes to arches and gates because the Arc de Triomphe is so huge. 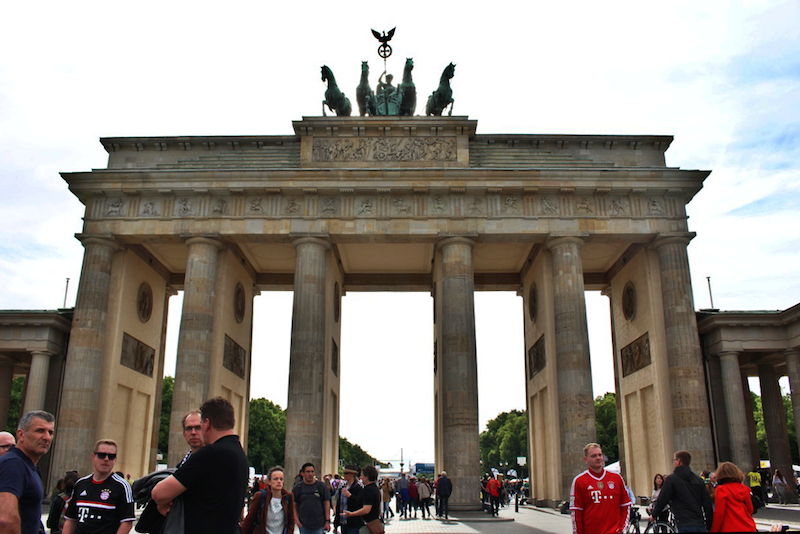 To me, the Washington Square Park arch in New York now seems laughably tiny and when I visited the Tor in Berlin, I was also surprised by its size. In my head it was much larger — and less cluttered with inebriated Borussia Dortmund and Bayern München fans who nobly took it upon themselves to prepare for the 20h Germany Cup final from the early morning hours (I’m happy to report that BM won, as my childhood Germany stints took place in Bayern). Despite the Triomphe Effect and the football horde, the historical symbolism of the Tor is still palpable. But to back up for a moment, the first thing that my friend Winston and I decided to do was eat. 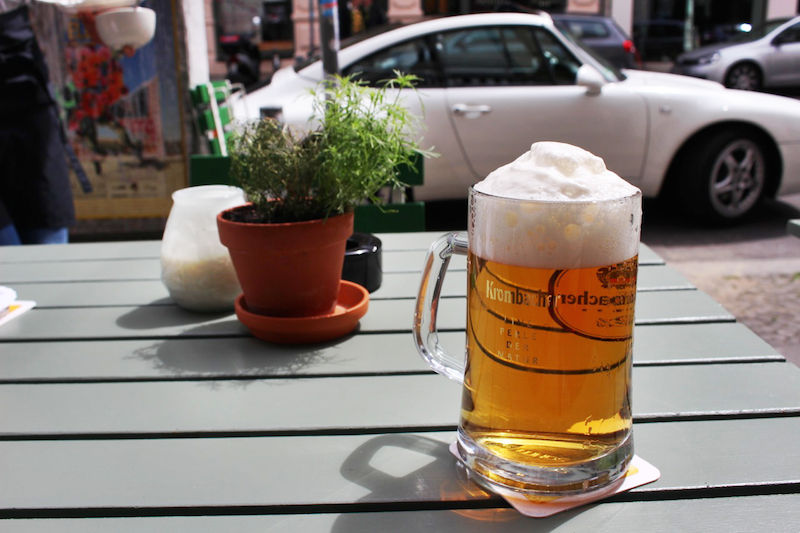 We went to Mädchenitaliener, a restaurant that Winston had been wanting to try for a while (“Every time I walk by, I smell truffle oil, so I think we should go.”) and ordered beers and plates of carbs. 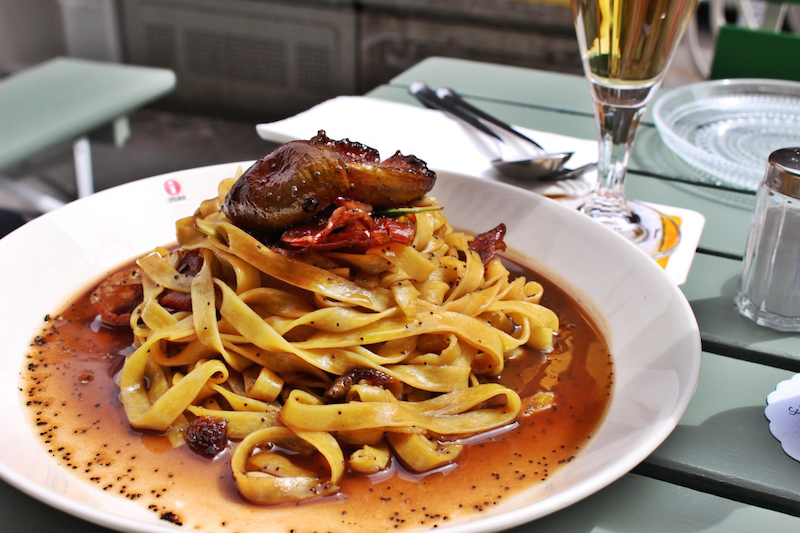 Winston’s tagliatelle with pancetta with figs and pancetta. 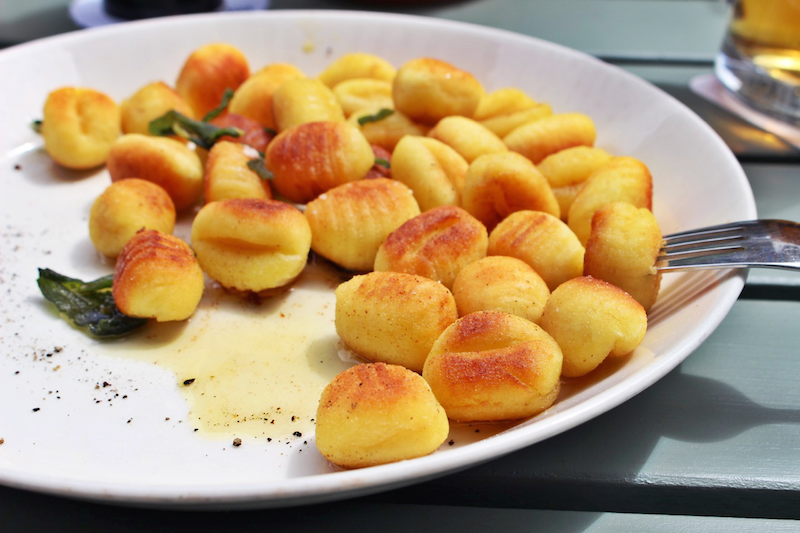 My plate of fried gnocchi in sage butter. After loading myself with pasta and beer calories, I struck out on my own to visit Museum Island, which is exactly what it sounds like: an island in the middle of the Spree with a bunch of museums on it. 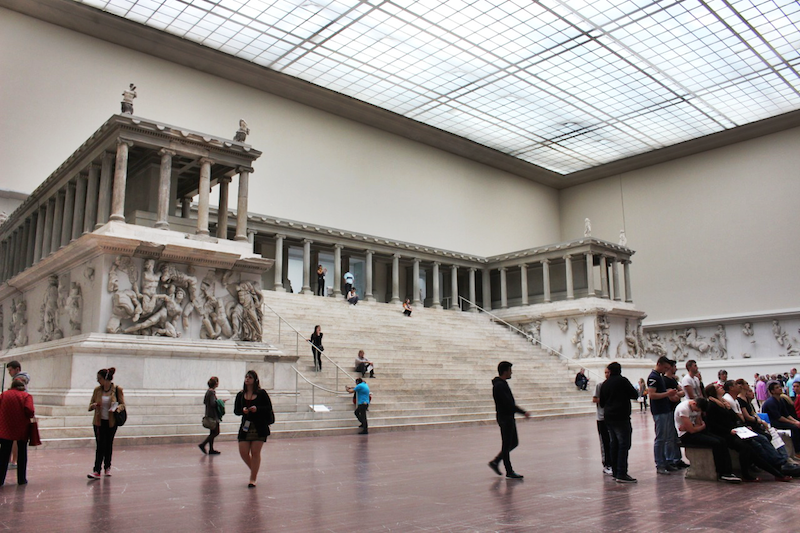 I decided to skip the crowds at the Neues Museum and go to the Pergamon Museum. The Pergamon houses collections of antiquities, the Near East, and Islamic art, but I mainly wanted to go for the series of large-scale reconstructions, including the altar after which the museum was named, pictured above. The altar was built in the 2nd century BCE in what is now Turkey and is particularly famous for the high-relief frieze around its base that depicts a battle between the Greek gods and the giants. In its original location, the front of the altar overlooked a cliff and people had to walk around it from the back to enter. The frieze’s best scenes were therefore on the back of the building. Several different groups of artists worked on the frieze, but there is a surprisingly strong continuity of style and form throughout the work. Other reconstructions include the magnificent Babylonian Ishtar Gate (~757 BCE), the Market Gate of Miletus (2nd Century BCE), and an entire room from Ottoman-era Aleppo. 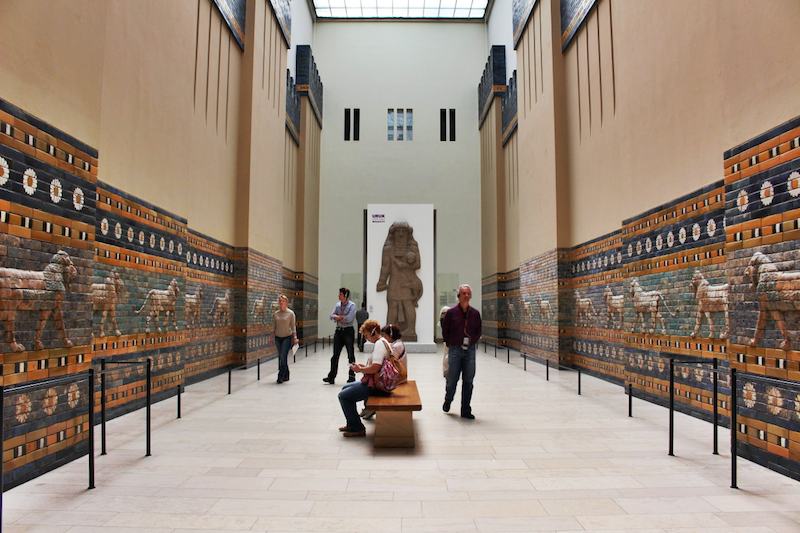 Babylonian tile work in the Pergamon Museum. 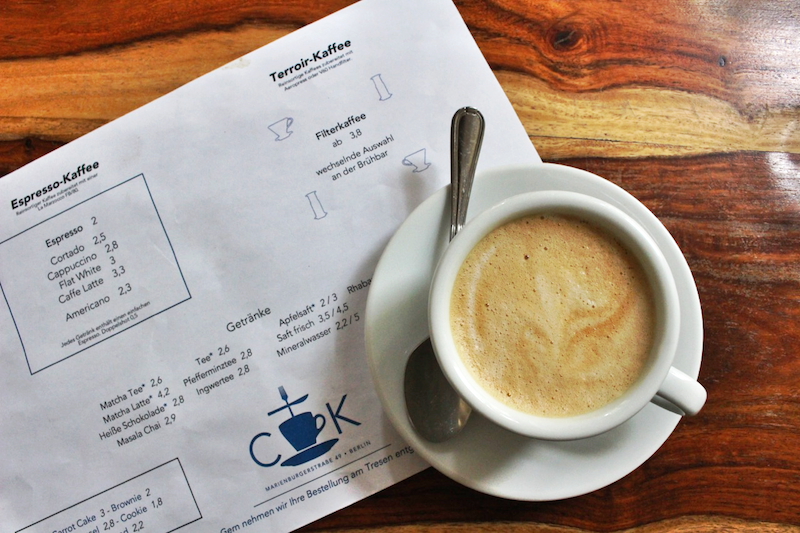 Of course, I don’t go anywhere without researching the coffee options and The Barn was at the top of my long list of Berlin coffee spots. 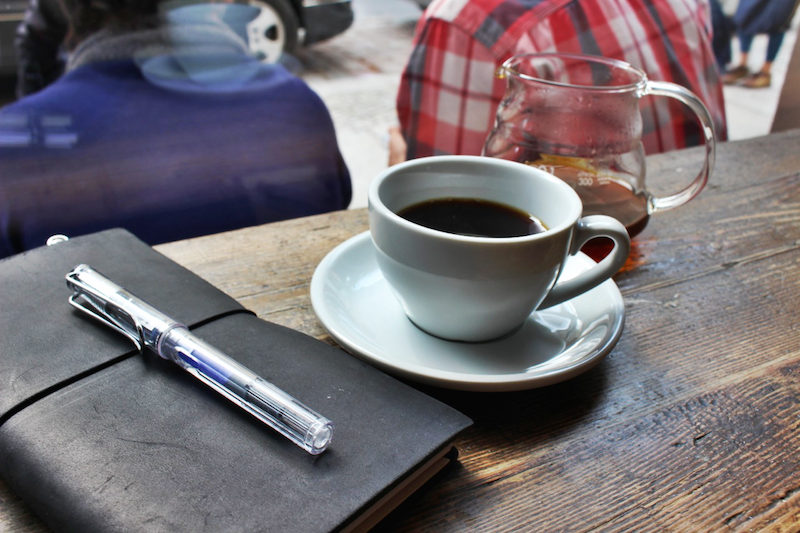 I parked myself in the window with a carafe of V60-brewed coffee and took some notes on the morning. 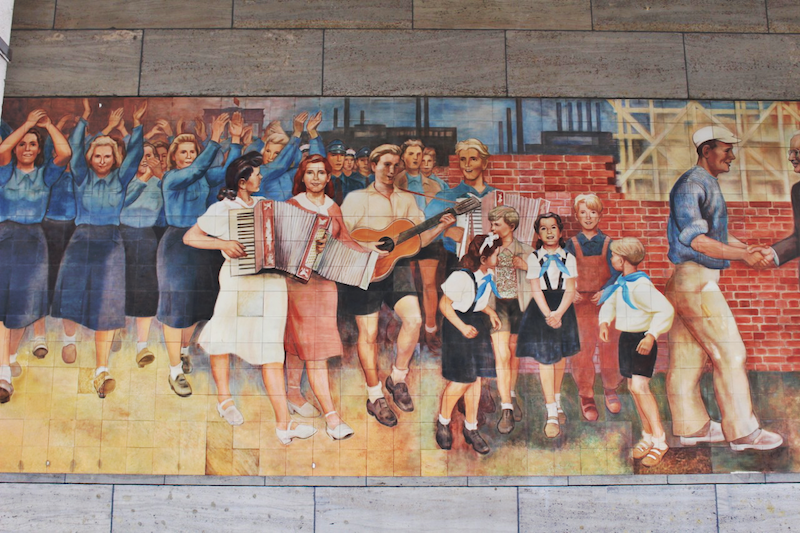 There are obviously reminders of Socialism all over East Berlin, including a huge Socialist Realism mural on the side of the Federal Ministry of Finance. To oversimplify and judge for just a moment, I find Socialist Realism to be one of the strangest moments in art history. Aesthetically unappealing, I’m always struck by how sinister these storybook renditions of Socialist propaganda feel. To quote The Lord of the Rings, “I think a servant of the Enemy would look fairer and feel fouler” (have I used this quotation on this blog before? I feel like I have…). 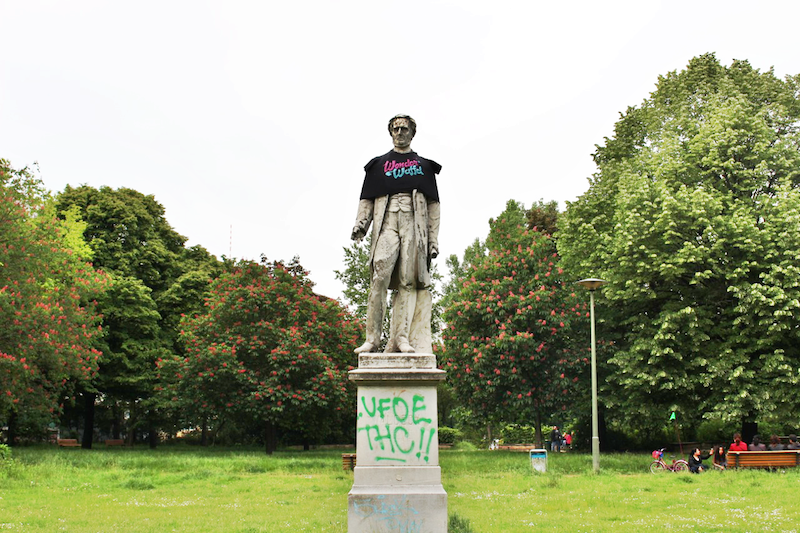 A statue in Waldeckpark is ready for the weekend. 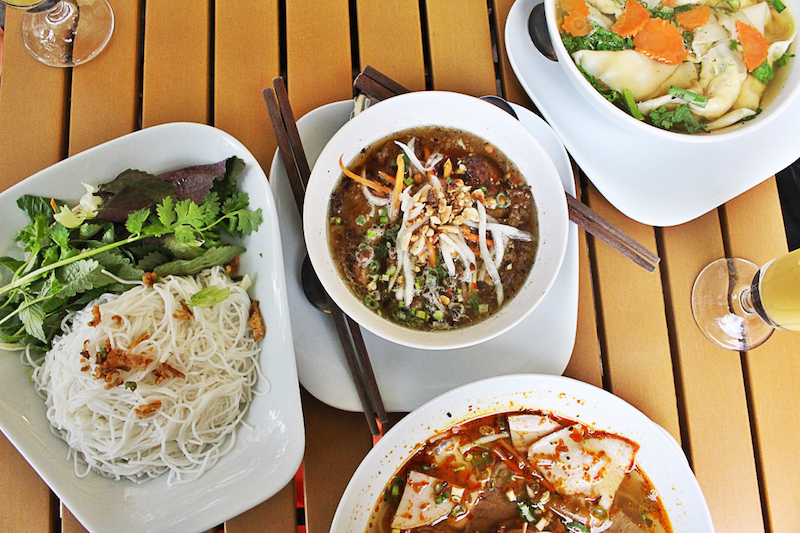 For dinner, Winston took me to a Vietnamese restaurant in Kreuzberg where we ordered pork belly, dumplings, and noodles. The waiter tried to dissuade us from ordering three entrees, which we found kind of offensive and proceeded to finish all the food and order two rounds of tropical fruit shakes, just to make a point. My hunger level when the food arrived is demonstrated by the poor composition of the photo above. Sunday morning brought a big German breakfast, which you’ve already seen, and a lot of rain. Fortified by the meats and cheese, Winston and I decided to hit some flea markets despite the weather. They were relatively empty and some vendors hadn’t even showed up because of the rain. Huge puddles made large areas of the market either inaccessible, or accessible only via navigation of a few strategically placed planks. 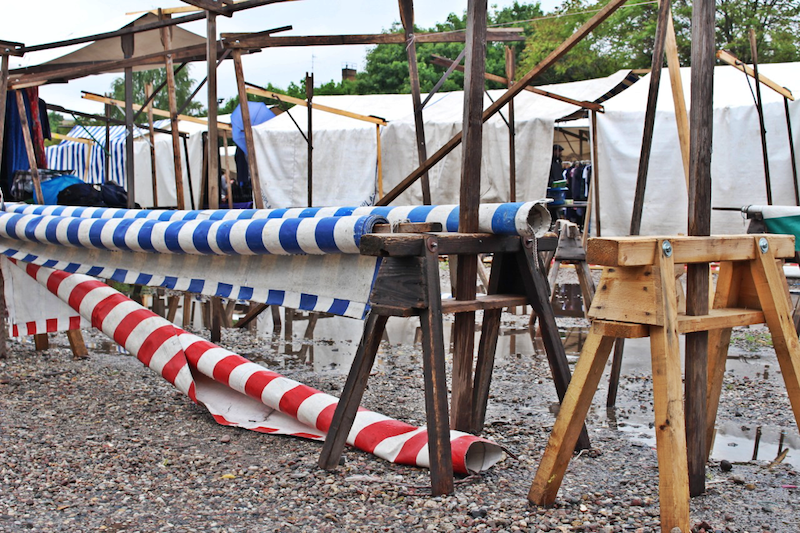 Imagine a Medieval market crossed with a Caribbean bayou. I came away with an old Asterix book and a ceramic Melitta coffee brewer. After trawling the flea markets I went to the Museum für Naturkunde, i.e. the Natural History Museum. I’m saving all my thoughts and pictures for another day though, because it was, to say the least, amazing. Again, after flea marketing and museuming all day, I needed a little coffee pick me up, so I made a quick one-two stop at No Fire No Glory (above) and CK Cafe (below). 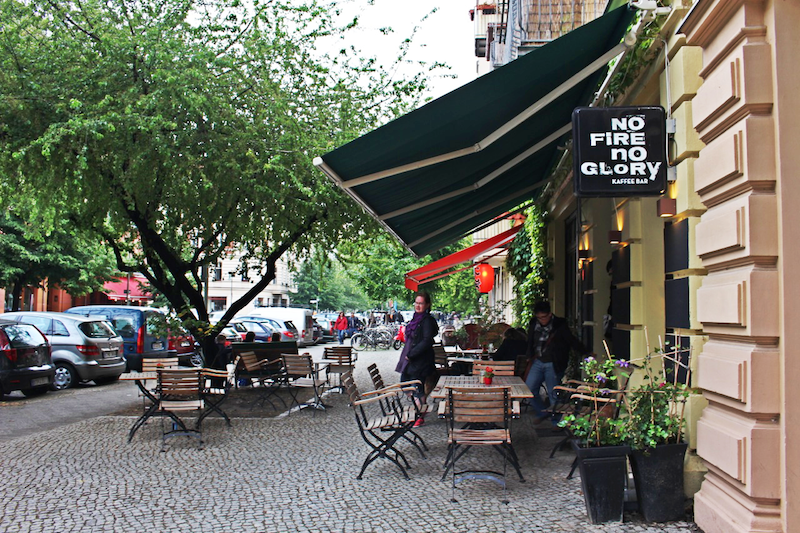 I had an excellent cappuccino at both of these places (which were also filled with MacBook-toting young people, in case you need any good working locations in Berlin), but No Fire No Glory’s was a little better. They have a stunning Kees van der Westen Spirit espresso machine and an attractive pourover/Aeropress bar as well. Unfortunately I don’t have photos of the two dinners we ate on Sunday night because the lighting was just too bad for photos, but let’s go back to the fact that we ate two dinners that night. Winston proposed either a Korean restaurant or a traditional German restaurant. Unable to decide, I asked if we could make two stops and being an intrepid eater like myself, Winston said yes. Stop #1: Su Korean BBQ for bibimbap, spicy ricecakes and tofu skins, and Korean fried chicken. Stop #2: Spätzle & Knödel for beer and spätzle in a mushroom cream sauce. I had been eating a lot of foreign cuisines in Berlin because it tends to be better there than in Paris, but I also love German food. I mean, who doesn’t love sausage and noodles and cream sauce? On top of which, German food always reminds me of my childhood in Germany; it is comfort food both in style and by association for me. By the end of the night we could barely walk and the zipper on my jeans broke (I’m still trying to convince myself that the latter was merely a coincidence), but totally satiated. The next morning I basically only had time to pack and go to the airport, but I’m sure I’ll be back in Berlin soon. 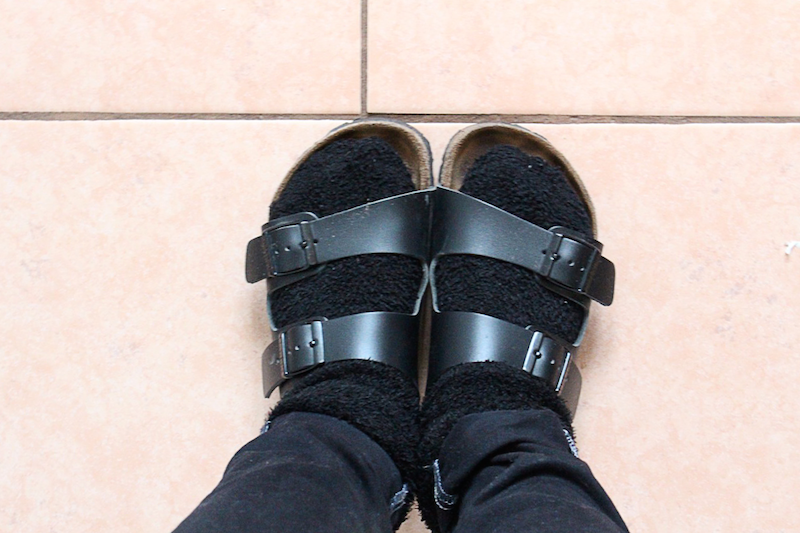 And as they say, when in Berlin, wear socks with your Birkenstocks. Let the Birks happen, Dani! Hey Alyx. Glad you had fun in Berlin. I know this book isn’t related to Berlin, but it does take place in Europe (Sarajevo, to be exact). It’s called “The Cellist of Sarajevo” by Steve Galloway. If you’re looking for a new book to read (and if you like historical fiction), I suggest this one. Hahaha thanks for the support, Angelina — I keep telling myself the same thing.